Why are we the best option for your diagnostic ultrasound needs? In short, because we provide our patients with the best overall value and customer service experience! Our fees are the lowest in the region. We keep our overhead low and focus on exceeding every patient's expectations. Our patients see no hidden charges or bills for ‘professional fees’ showing up in their mailboxes. We're a husband and wife team of sonographers who met 'on the job' while optimizing our skills at a Harvard teaching hospital and we're passionate about delivering imaging services of the highest quality. We've all watched as health insurance has devolved from bad to worse and we believe we've ideally positioned ourselves to provide you with the best bang for your buck. We love what we do and we sincerely appreciate the opportunity to care for our patients. For the growing number of people leaving the mess of traditional insurance behind and opting for a healthcare savings ministry or a flexible spending account, we are a perfect fit for you. Like many medical professionals, from local primary care physicians to midwives and chiropractors, we have chosen to move largely toward a simple fee-for-service model. Many patients are waking up and taking a fresh look at the options they have before them. On a personal note, a couple of years ago we joined one of the four main healthcare sharing ministries and we could not be happier with our decision. We are delighted to see some truly great local 'concierge medicine' physicians gaining more market share and the midwifery community growing so substantially. When there are more options, patients win! We're right in this with you. Just give us a call with any questions. We love to talk with our patients! Who will benefit most from using our services? I have an insurance policy with a high annual deductible. How and when should I consider using your services? The bottom line is that many people have policies with out-of-pocket deductibles so high that the coverage feels nearly unusable to them. When the need for a medical ultrasound exam arises, patients who are more informed will research their options and make a choice which is best for their unique situation. If you have a high-deductible insurance plan and you won't meet your deductible this year, your out-of-pocket-cost will be much lower with us. Under what scenario might I be better off using my traditional insurance? If you have excellent insurance, which will cover the entire cost of the ultrasound, or perhaps you're likely to spend beyond your deductible this year, then our services may not be your best option. Also, if you need surgery and the facility you choose requires in-house ultrasound exams, they may require you to repeat the exam you had with us. Yet more often than not, patients get results from their exam that indicate no need for surgery or other expensive intervention. Is Coeur d’Alene Ultrasound a diagnostic or elective ultrasound facility and are your services covered by all insurance plans? We are ARDMS-credentialed diagnostic medical sonographers who offer both diagnostic and elective ultrasound imaging services. We currently accept Idaho Medicaid and Medicare. We regularly provide patients with itemized receipts which they give to their health share ministry or their insurance provider for credit toward their out-of-network deductible. Please see our comments above for more perspective on the current insurance landscape generally. With more and more traditional insurance providers taking an 'avoid paying at any cost' approach to reimbursement issuance, it's getting harder and harder for care providers and their patients to know which exams will be 'approved for payment' and which you'll have to cover yourself. The desires of patients and care providers are clearly made less and less important as these lists of 'pre-approved' indications for the exams are getting shorter and shorter. Accordingly, many ultrasound exams are becoming more and more elective by default. For example, maybe you're pregnant and would like to hear your baby's heartbeat for a little reassurance. Most insurance plans allow only one or two covered ultrasound exams. Or, perhaps you'd like to utilize your insurance to help you check on the current state of your carotid arteries and your abdominal aorta...good luck! If your medical history doesn't exactly match very specific criteria, there's nothing your care provider can do to get your insurance to cover those ultrasound exams. This is a real shame because there is solid recent evidence which shows that changes in diet and lifestyle can significantly reduce a person's risk for stroke. And patients would be much more motivated to adapt these diet and lifestyle changes if they were more financially incentivized to see the current state of the walls of their arteries! If only insurance companies could perceive the mutual benefits to be gained in these win-win scenarios. For now, we have to look at the facts on the ground. The system is broken and the people who care naturally seek the solutions they need. Many patients are seeing that they need to become proactive and 'take the reins' themselves with their health-management decisions. It's actually much easier than dealing with the dysfunctional system which is collapsing beneath our feet. Patients are simply choosing the best overall value and fit they can find in a local provider after doing their own research. It's really quite refreshing. And it just makes so much more sense. What is the best time for my elective ultrasound? Viability scans can be done at any point in pregnancy. Gender Determinations can be done anytime after you turn 14 weeks. At this time 4D ultrasound reveals a very skinny little baby, but it is exciting to see their full body head to toe and thrilling to see how much they move. 30-35 weeks is about when they develop into 3-5 lb. babies. This is the best time to view your baby’s unique features and see how full their cheeks are becoming. My doctor’s office already performed a full fetal anatomic survey on my baby. Will an additional brief scan at Cd’A Ultrasound be safe for my baby? Multiple studies performed over the past 30 years have found that ultrasound has not been shown to cause any harm to mother or baby, even at the elevated cumulative exposure-times needed to monitor high-risk pregnancies (i.e. The Lancet British medical journal, 2004). Nearly all OB/Gyn physicians around the world support the safety claims regarding limited to moderate fetal ultrasound exposure by ordering or performing routine fetal surveys on their own patients. Further, their perceived confidence in its safety has for decades allowed them to use non-medically-indicated ultrasound exposure time to provide routine assessments of fetal gender. 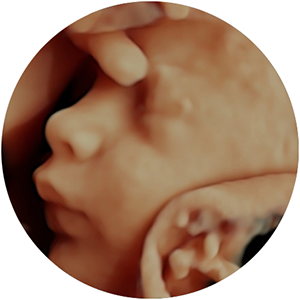 3D/4D ultrasound machines emit the exact same sound intensity as standard 2D ultrasound units, yet employ software which creates 3D volumetric images from the data and echoes returned. The American Institute of Ultrasound in Medicine (AIUM) recommends that all fetal ultrasound scans should be performed by credentialed medical professionals specifically trained in fetal imaging. Both Travis and Trina Armstrong are ARDMS-Registered Diagnostic Medical Sonographers with 33 years of combined experience in high-risk Obstetric and 3D/4D ultrasound. Please visit our About page for more information on our medical training and professional credentials. All ultrasound equipment brought into the USA is regulated by the FDA and ours is tested annually for continued compliance with FDA standards. We take safety a step beyond common practice in the ultrasound community by actively using the lowest acoustic output settings, as well as constantly monitoring Thermal (TI) and Mechanical (MI) indices. Since we are not physicians, we can only provide diagnostic results to your provider for scans read by board-certified radiologists with whom we contract at Direct Radiology, headquartered right here in Coeur d’Alene. Can a 3D/4D elective ultrasound replace the need for a diagnostic medical ultrasound? Not in any way. 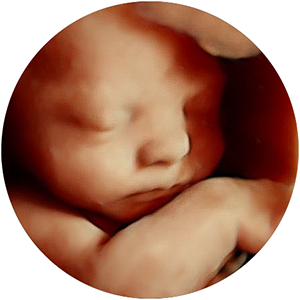 There is mounting evidence that seeing your baby with 3D/4D ultrasound promotes early maternal-fetal bonding and facilitates a stronger early connection with the unborn child among family members, but it could never replace your diagnostic full fetal survey. The complete diagnostic medical ultrasound survey is entirely separate and essential for determining the overall growth and well-being of your baby at the best time to evaluate anatomical structures, around 20 weeks. 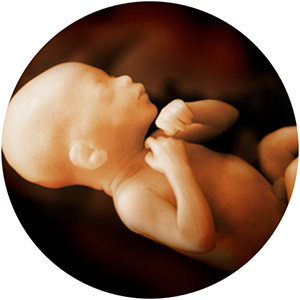 How can you determine gender accurately at only 14 weeks gestation? We have been doing 14 week gender determinations for the past 12 years in San Diego, CA and can honestly say we have become experts at this unique challenge! We have to be 100% certain of your baby’s gender or else you return within 7 days at no charge for our final assessment, which is guaranteed to be accurate! Why can’t they determine gender at 14 weeks at my doctor’s office? Perhaps they can! Even though gender can be determined accurately at 14 weeks gestation trans-abdominally, many medical sonographers have not become experts at determining fetal gender this early in development. Often they are more accurate in determining gender near the gestational age they see the majority of their pregnant patients…around 20 weeks. This is because most insurance plans will only cover 2nd trimester scans at around 20 weeks since this is the best time to survey the more developed fetal anatomy. Is there any preparation for my ultrasound? Early transabdominal fetal viability scans necessitate a moderately full bladder, which serves as an acoustic window for the sound to travel through. Typically, at 7-8 weeks gestation and beyond, we’re able to confidently confirm viability without doing an internal ultrasound. A full bladder is also necessary for all transabdominal (external) pelvic ultrasound exams. You’ll need to empty your bladder before a transvaginal ultrasound. If you’re unsure of your dating, just try to stay hydrated and plan to have a moderately full bladder by the time of your appointment. Fetal gender determination scans do not require any preparation or bladder filling. Renal (kidney) and bladder ultrasound exams require a moderately full bladder prior to the scan. Fasting is not necessary for these scans. We may ask you to empty your bladder after we take the first few ultrasound images, depending on the concerns indicated by your provider. Carotid, thyroid, scrotal, breast and extremity ultrasound exams do not require any prep. 3rd Trimester imaging does not require a full bladder. However, it’s always best to stay hydrated, particularly when you’re getting ready to deliver a baby. Improved hydration has been shown to increase the amount of amniotic fluid around the baby, which is essential in getting the clearest 3D ultrasound images.